On Saturday March 2, 2013 the Crown Prince staff will be participating in the Greater Orange County/Inland Empire Muscle Walk – a fundraising event through the Muscular Dystrophy Association (MDA). Funding from the walk supports Muscular Dystrophy Association’s research, support service, and education initiatives. Our employees, family and friends had such an amazing time last year that we decided to band together once again to try and raise even more money. We chose MDA because of all the tremendous things they do for the families they serve. We hope you’ll do the same and join our team! “My older brother Paul had Duchenne Muscular Dystrophy so I have been involved all my life. This year will mark the 8th year since his passing. My first event with the MDA was in 2003 when I participated in a Lock-Up event and had to raise my bail money to get out. This year we are joining forces with our dear friends from Adam’s Ducks. This team was formed in late 2010 by Adam Bohanon-Mullett. Adam is a 12 year old from the High Desert who has a Myoadenylate Deaminase Deficiency (MADD), a form of Muscular Dystrophy. Adam decided he wanted to find a cure and has become active in fundraising for MDA. In January 2011 he was named the Inland Empire’s Goodwill Ambassador. Since Adam’s diagnosis 3 years ago, his two sisters Tommie and Aggie have also been diagnosed with MADD. This is an incredibly strong family that instead of asking why, dedicated themselves even more to finding a cure and bringing about greater awareness to MADD and Muscular Dystrophy as a whole. We are honored to be walking side by side with such an inspiring family. 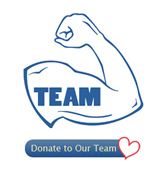 Please consider adding your support by visiting our team fundraising page. Donations made on the site are submitted securely. Or, to participate as a walker in your own city, visit walk.mda.org to find an event near you.